Neoepitope antibodies recognize the newly created N or C terminus of protein degradation products but fail to recognize the same sequence of amino acids present in intact or undigested protein. 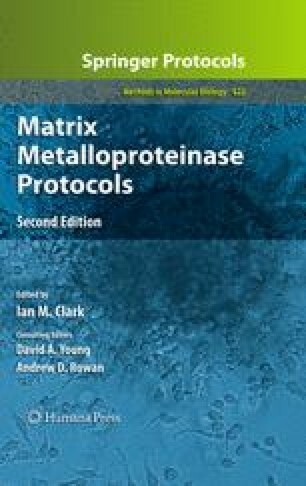 Aggrecan neoepitope antibodies have been pivotal in studies determining the contribution of matrix metalloproteinases (MMPs) and aggrecanases to aggrecanolysis. In particular, an antibody to the A374RGSV N terminus was instrumental in the landmark discovery of the aggrecanases, ADAMTS-4 and ADAMTS-5. Antibodies to neoepitopes at the major MMP cleavage site DIPEN341 ↓ 342FFGVG helped to distinguish MMP-driven aggrecan loss from aggrecanase-driven aggrecan loss and idenepsied a role for MMPs in late-stage disease. More recently, neoepitope antibodies that recognize cleavage sites in the chondroitin sulphate-rich region of aggrecan have been used to show that aggrecanase cleavage proceeds in a defined manner, beginning at the C terminus and proceeding to the signature cleavage at NITEGE373 ↓ 374ARGSV in the interglobular domain. Work with the C-terminal neoepitope antibodies has underscored the need to use a suite of neoepitope antibodies to fully describe aggrecanolysis in vitro. In this chapter, we describe the production of two aggrecan neoepitope antibodies as examples: the monoclonal anti-FFGVG antibody (AF-28) and the polyclonal anti-DIPEN antisera. The CGGFVDIPEN and CGGNITEGE peptides used for the production of the anti-DIPEN and anti-NITEGE antisera were a generous gift from Drs. Peter Roughley and John Mort, Shriners Hospital, Montreal, Canada. We thank Georgia Deliyannis for the monoclonal antibody work. We acknowledge financial support from the National Health and Medical Research Council (Australia), the Victorian Health Promotion Foundation and the Arthritis Australia.